World of Warcraft’s latest expansion, Battle for Azeroth, has been all about the faction war between the Alliance and the Horde. That conflict isn’t coming to an end any time soon, but there’s a rude third participant knocking on the door: the Old Gods, specifically N’zoth. The Old Gods have been a villain to various degrees since Classic, where players stormed Ahn’Qiraj to kill C’thun, but this expansion gives players a whole new Old God opportunity — the ability to accept their “gift” and wear their corruption around like a neat little hat. A new quest chain has been put into the game in which players find a Naga medallion, a dagger, and a very polite whisper who just needs the player to perform some blood rituals. The quest can be started at a Naga Invasion World Quest, and begins when a Naga drops the Azsharan Medallion. Savvy players will recognize Xal’atath, Blade of the Black Empire, a previous artifact weaponwho shared dangerous secrets with shadow priests. Xal’atath was one of the most popular new characters of Legion, and now she’s back in a whole new body, thanks to us gullible players who fall for her extremely suspicious story and empower her via Naga souls and murder. The quest chain culminates with the players being confronted by N’zoth himself. N’zoth, an Old God, has been teased for some time. He appeared in the animated short “Warbringers: Azshara,” and is the Old God who created the Naga after the fall of Azshara’s empire. He’s been biding his time for over 10,000 years, and instead of threatening the player or killing them, he seems pretty interested in working with us, and he gives us a gift. The Gift of N’Zoth gives players a purple crown with an eye, and when it’s active, the player can see everyone else who is wearing the Gift of N’Zoth. This also allows for another major choice for players: They can either cleanse the Gift, returning to their normal, uncorrupted form, or they can keep it, and continue to adventure in Azeroth, keeping an eye on all of their friends who are also corrupted. Players who cleanse the Gift will receive a toy that gives them the cosmetic effect again temporarily. The Old Gods are all about corrupting through their insidious influence. The Emerald Nightmare, the fallen World Tree in Northrend, Cho’gall, and Deathwing are all examples of the damage they’ve done to Azeroth. 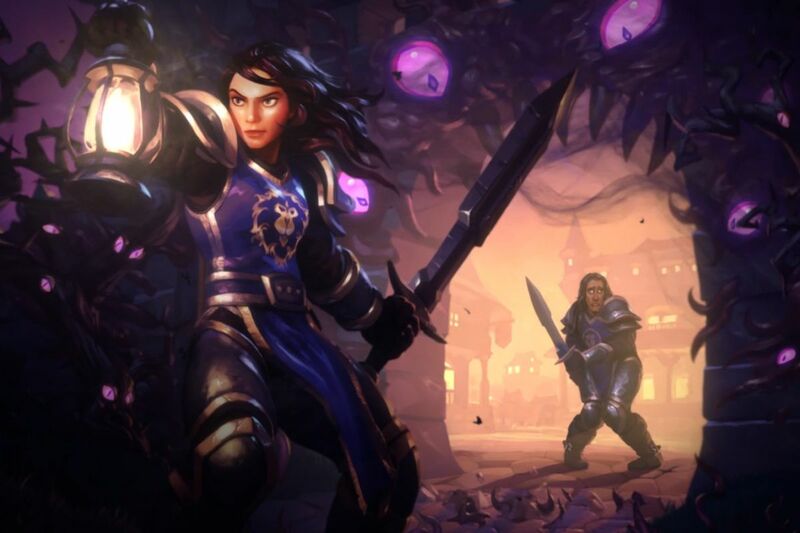 In a recent interview with Polygon, game director Ion Hazzikostas said that the team was working to only implement player choices with some kind of payoff or interesting result. This means that players who maintain their third eye may end up seeing major consequences, especially because we’re heading to Queen Azshara’s domain in the upcoming Rise of Azshara patch. No matter how this turns out, I’m sure it will be fine. I don’t see how any of this could go wrong. The players have, once again, made a stellar set of decisions and everything seems perfectly normal. Which player had the best sneakers on All-Star Weekend?